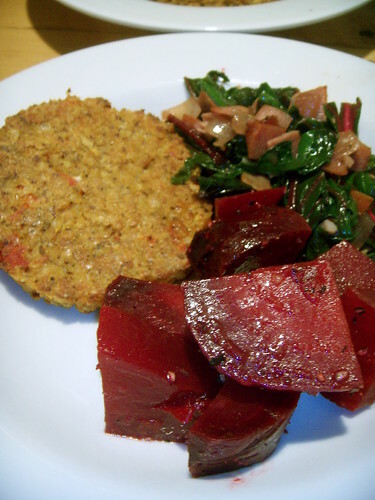 totally broke: beets beet greens and tvp patties, originally uploaded by aarn! +25th July, 2008+. finally figured out the trick with tvp (textured vegetable protein). rehydrated the tvp with some boiling water, then squeezed all of the water out with cheesecloth and placed in a mixture of beaten egg, garlic, sun dried tomatoes, onions, worcester sauce, and a little oil, and the tvp sponged it all up, then added a shake of pankos, and a spoon of flour to help with the cohesion. used a container lid to shape the tvp into patties and baked them. beets were boiled then tossed in butter, sea salt, and fresh ground pepper. beet greens were cooked like collared greens, sauteed in a spash of oil with prosciutto, garlic and onions, and a splash of apple cider vinegar, and then covered on low heat until tender. made a sweet and sour sauce with pear, lemonade, sugar and orange juice, and then added some ketchup, brandy, and a dash of worcester sauce and made it into a little barbecue sauce ditty for dipping.